Season: Early August to Early November (PYO). Year-Round (Market). Our orchard grows about 18,000 apple trees on roughly 35 acres of land. We invite you to pick many varieties, including the Star Gala that was discovered right here at Weaver’s Orchard. If a homegrown apple is listed as finished or not yet available for Pick-Your-Own, look for them in our farm market. We keep apples fresh and crisp in cold storage throughout the winter. Our apple cider-pressing season lasts from September to May, so if you’re craving that fresh apple taste after apple harvesting season, pick up a jug in our farm market! Learn About the 30+ Varieties We Grow! Lodi Very firm and tart, making excellent pies and sauces. Earligold Tart apple with firm flesh. Good for sauces and baking. Rambo Very tart apple great for sauces and baking. Sansa Excellent early eating apple with sweet flavor and crisp flesh. Ginger Gold Sweet-tart, firm apple, very versatile, great for snacking, pies, salads, sauce and baking. 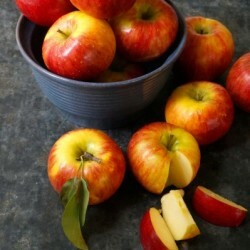 Golden Supreme Sweet all-purpose apple, great for snacking, salads, baking and drying. Gala Juicy and very sweet with crisp yellow flesh. It is a great snack and good in salads. Honeycrisp Amazing eating apple with very distinct sweet flavor. Firm flesh makes it great for pies and baking. Blushing Gold Sweet-tart flavor. Good for snacking, salads and baking. Early Fuji Very sweet flavor with a firm, crisp flesh. Great for eating, sauces and baking. Smokehouse Sweet-tart apple used for baking and sauces. McIntosh Softer apple with a mildly tart flavor. Excellent for sauces and eating. Autumn Crisp Sweet, crisp and juicy. Excellent all-purpose apple with a flavor similar to Gala and Honeycrisp. Red Delicious Sweet, crisp and juicy. This eating apple is good for salads too. Cortland Slightly tart and very crisp. The flesh is very white and resists browning! Great for everything. Jonathan Tart, crisp and juicy apple, excellent for snacking and sauces. Empire Cross between McIntosh and Red Delicious. Extra crisp with a sweet-tart flavor. Good for snacking, salads and sauces. Golden Delicious Sweet and juicy, softer flesh. Very versatile, great for snacking, pies, salads, sauce and baking. Crimson Crisp Extremely crunchy tart apple. Good for baking and sauces. Shizuka Sweet, juicy, firm apple similar to a Crispin. Jonagold Cross between Jonathan and Golden Delicious. Crisp, juicy with a great sweet flavor. Excellent for eating and baking. Macoun Sweet-tart flavor, softer flesh. Good for eating and sauces. Stayman Sweet-tart flavor, firm and juicy. Very versatile, great for snacking, pies, salads, sauce and baking. Crispin Mutsu Slightly tart flavor, very juicy, firm and crisp. Good for snacking, pies and baking. Suncrisp Sweet and snappy, juicy and very firm. All-purpose apple, great for eating, pies and baking. Cameo Sweet-tart flavor with firm flesh that resists browning. Good for everything. Fuji Very sweet flavor with a firm crisp flesh. Great for eating, sauces and baking. Granny Smith Very tart, crisp and juicy. Excellent for baking, pies and sauces. Good flavor for eating. Pink Lady Very crisp with a sweet-tart taste. Great for snacking, salads, pies and baking. Braeburn Sweet-tart, juicy and firm. Best for snacking, salads, pies, sauces and baking. All-around apple.